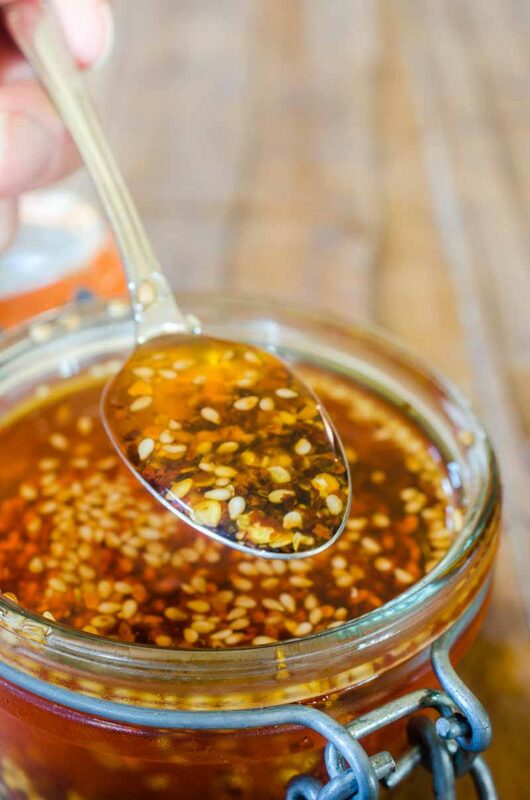 Hot Chili Oil is a staple in my kitchen and it’s crazy easy to make on your own. 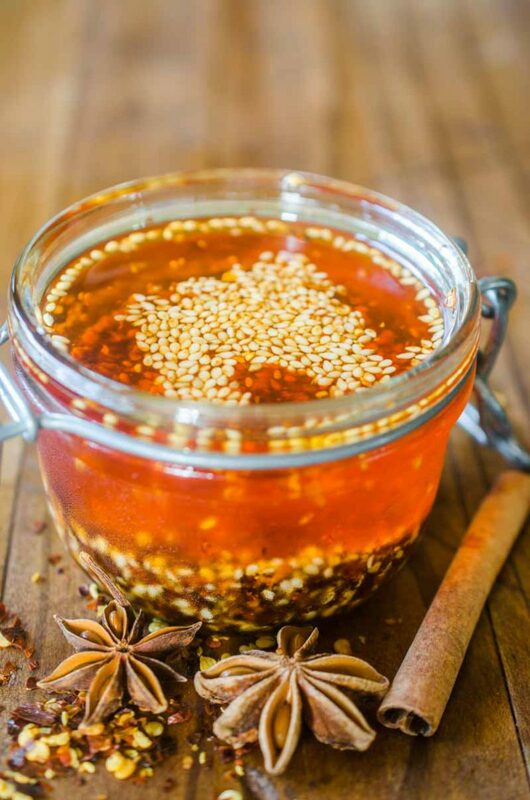 Make some today and use in all of your favorite spicy Asian recipes. If you have been following the blog for a while, it is no secret that I love spicy food. Anything and everything I can add a kick to I will. Even when I was pregnant, I ate a jar a of Mrs. Renfros Habanero Salsa every week. I’ve been eating Spicy Pepper Steak since I was two and any time I can drizzle hot chili oil over something, I will. I have taken a crack at making hot sauce before. My habanero hot sauce is a great to add to tacos or steak. But when it comes to Asian dishes, Hot Chili Oil is where it’s at. What is hot chili oil? Hot chili oil is a condiment popular in China and East and Southeast Asia. It is an oil, such as vegetable, that is infused with hot chili peppers. I use hot chili oil when I make Shrimp and Pork Wontons in Spicy Sauce and pretty much any stir fry. But, despite using it so much, I have only tried to make it a few times. The first couple of times weren’t very successful so I didn’t try again until recently. And I’m SO glad I gave it another go. What kind of oil do you use? You want to use a really mild tasting oil. Vegetable or Canola is perfect for this. Keep the oil at 225 – 235 degrees. I find that if the oil gets much hotter than that the aromatics and chili peppers start to burn. 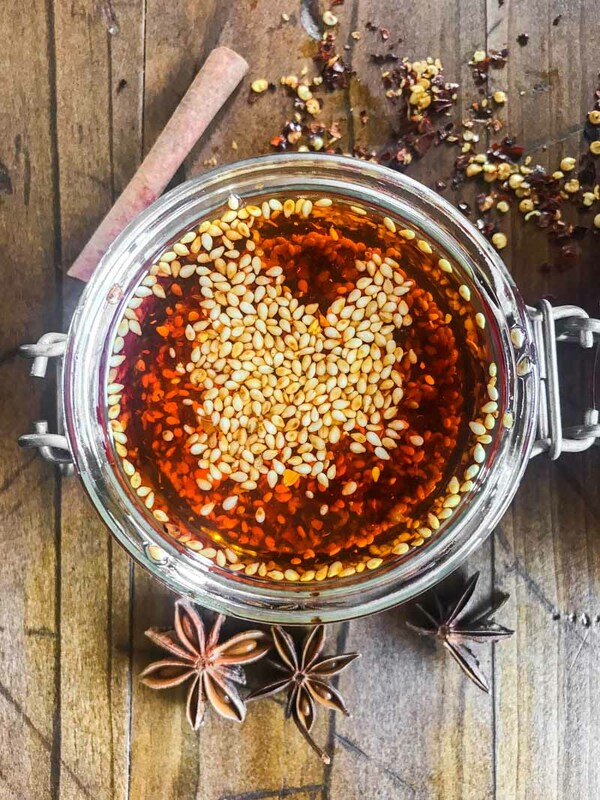 Traditional hot chili oil recipes call for Sichuan chili flakes. Those can be kind of hard to find if you don’t have an Asian market near you. I use Crushed Red Peppers which are very easy to find and taste just as great in this recipe. During my recipe testing, I have made hot chili oil by simmering simply oil and chili peppers together. I have made it by simmering the aromatics and chilies in the oil. And I have made it by simmering the aromatics first, straining the oil and then pouring it over the top of chili flakes. Of all three testing attempts, my favorite was the third. The chili flakes get a toasted flavor by pouring the hot oil over the top, without getting over cooked. 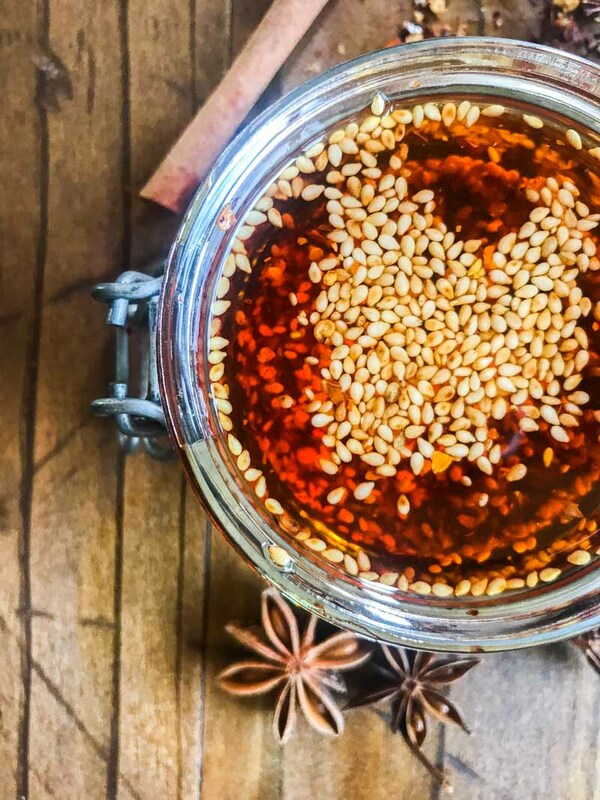 You can use this Homemade Hot Chili Oil in so many recipes. In addition to the shrimp and pork wontons I mentioned above, this chili oil is perfect to use in Quick and Easy Pork Stir Fry. 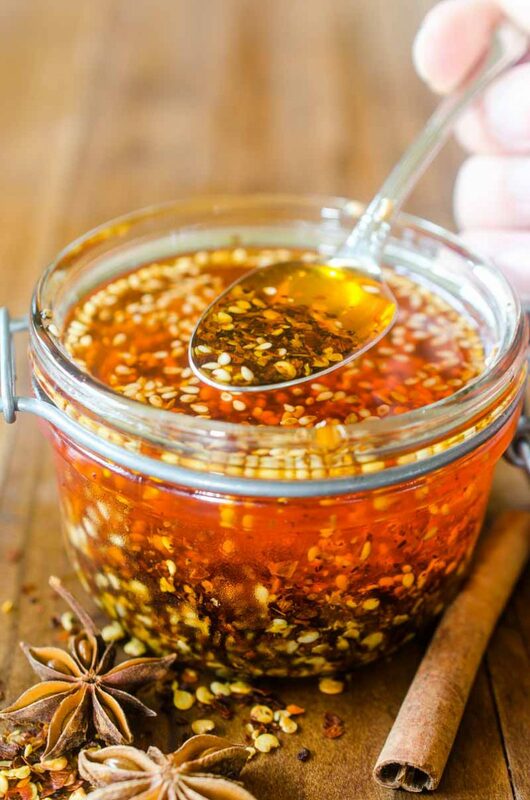 It is also a great condiment to serve alongside spring rolls or anything you just want to give a little kick to. Combine canola oil, star anise, bay leaves, cinnamon and szechuan peppercorns in a skillet over medium heat. Use an instant read thermometer or candy thermometer to make sure the oil stays at 225 - 235 degrees. Simmer for 30 minutes. Strain oil through a fine mesh strainer. Heat oil agin to 225 - 235 degrees. Combine crushed red peppers and sesame seeds in a bowl. Slowly pour oil over the top. Oil may bubble slightly. Mix well. Once oil has cooled, put in an air tight container and store in the refrigerator. Will keep for a few months. I will definitely try this! Looks easy to make! I am making this ASAP! It looks AMAZING! We do a ton of Asian cooking in our house….so perfect to have homemade and on hand! My husband will love this oil! All those flavors! This sounds amazing! Love that you’ve perfected how to make it yourself! This looks perfect for a stir fry! My husband would love this! Thanks for sharing!